Before I started my healthy relaxed hair journey on a quest for healthy relaxed hair I knew nothing about relaxer stretching. The funny thing is I would sometimes do it. If I wanted to save some money or didn't feel like going to the salon I would go more than six weeks between my relaxer touch-ups. Since I didn't count weeks between my relaxer touch-ups back then I don't know how long those stretches tended to go. 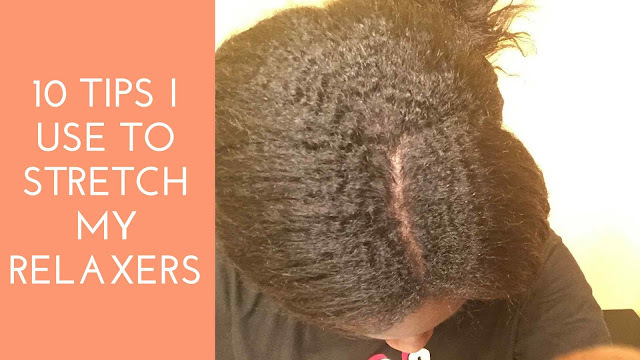 Since I discovered that relaxer stretching is a key part of a healthy relaxed hair regimen I've been consistently stretching anywhere from 12-16 weeks. I even stretched as long as 18 weeks. Additionally, I've learned how to handle my relaxed hair during these stretches so I'm able to reap the benefits. Here are my 10 tips for having a successful relaxer stretch. Detangling is essential. Particularly when you have two or more textures. When done properly, detangling gets out any knots that could tighten and eventually break. Detangling also removes shed hair that could cause tangles. When I detangle before and during my relaxer stretches I section my relaxed hair. This makes it easier to handle with little to no damage. With each section, I start at the bottom with my fingers carefully working my way up to my scalp. To make sure the section is fully detangled I then take my seamless, wide-tooth comb and follow the same process. Cleansing is essential for healthy hair. Not only does your hair need to be cleansed, but also your scalp. A healthy scalp leads to healthy hair. Especially during my relaxer stretches I like alternating between sulfate-free, sulfate or clarifying shampoos and co-washes. I occasionally use the sulfate shampoos to remove any residue and buildup to make sure my hair is properly cleansed. I don't use the sulfate shampoos often because sulfates can be harsh and dry out your hair. Co-washes are great to use when my hair needs an extra burst of moisture. This is a must. Deep conditioning keeps hair soft, supple, and more manageable. I've found it's best to do it weekly, with each wash. I also like to pay close attention to the line of demarcation, where my natural and relaxed hair meet because it's a weak point prone to breakage. Keeping it conditioned helps lessen the chance of breakage. There are a couple of ways I like to deep condition. One way is using a deep conditioner. The other is doing a hot oil treatment. Whichever type of product I use I leave it on for at least 30 minutes and sometimes use heat to amp up the conditioning. It's important we keep our hair moisturized. It helps to minimize tangles, knots, and breakage at the line of demarcation. The deeper I am into my stretch, the drier my hair seems to get. I'm not sure why though I suspect it has something to do with my natural curls slowing down the journey of oil from my scalp down the hair shaft. Since my hair tends to be on the drier side when I'm relaxer stretching I moisturize several times a week. I try to moisturize at night right before bed so my hair has time to absorb it. I also typically seal in the moisture with a natural oil. Right now I've been using grapeseed or almond oil. Watch this video to see how I moisturize and seal my relaxed hair. I've found I don't just need moisture, but also protein. I get protein from eating protein-rich foods like chicken and eggs. Additionally, I use protein-rich hair products such as the Aphogee Keratin 2 Minute Reconstructor. Or I do a hard protein treatment using Aphogee's 2 Step Treatment. When I use hair products with protein I focus on the line of demarcation down to my ends since those are the parts of my hair strands that are weakest and need protein. While I use protein I try to be light-handed and make sure I balance it out with moisture. I don't want to defeat the purpose and end up with protein overload which comes with its own set of problems. I've alluded to this when talking about detangling but working on your hair in sections make relaxer stretching easier. By working in sections you lessen the amount of tangling that can happen from manipulation and washing. I've found working in sections keeps me more focused on the task at hand and I'm more thorough. It also allows me to apply a product, such as conditioners, to all of my hair not just my edges and the hair on top. Touching your hair, leaving it loose and constantly styling can cause stress to the hair and be damaging. So wearing low manipulation styles such as buns, braided styles, and even ponytails can be helpful. Relaxer stretches are also a good time to pull out more longer-term protective styling such as wigs, crochet braids, and weaves. While I tend to wear braids and buns a lot, I wear them more often than not the longer I go between relaxers. This is something that should be done whether you're stretching your relaxer or not. Wrapping your hair with a satin wrap at night is another way to help stop breakage. Wrapping your hair keeps it in place so it doesn't move which can cause friction resulting in tangles or even breakage. It also keeps your cotton pillowcase from drawing any moisture from your hair. Your hair will tell you what it needs, what it does and doesn't like. It will also tell you when you need to end your stretch. So pay attention and don't ignore the messages your hair is giving you. This is perhaps the most important tip yet. During your stretches, your hair is more delicate, but can also be more frustrating since you're working with two different textures. So patience is a must. By being patient and taking your time you'll be able to do all the things mentioned above without causing damage to your hair. 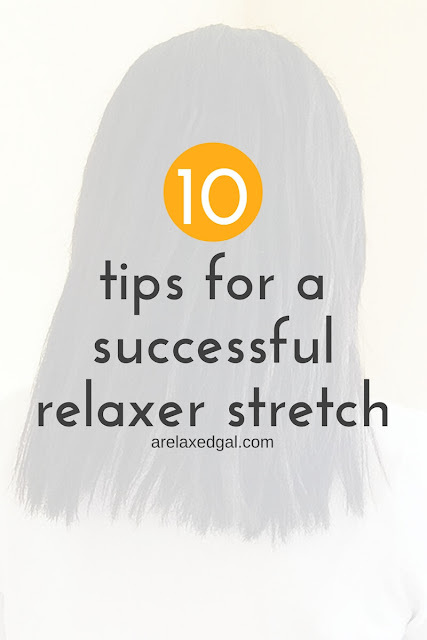 What are your tips for having a successful relaxer stretch? It really is. I have to keep reminding myself of that. Listening to your hair and patience is definitely key. Great tips. Do you have any additional tips for relaxer stretching?